Feeling extra emotional this evening. I miss my friends and family back home something fierce. I’m working at the rink I rarely work at and it’s making me realize how much I love my home rink. I am lucky enough to work with my significant other and some of the best people in the world. But being here, I miss Matt even though I saw him this morning. It’s national best friend day which makes me miss my best friend so much it hurts. I haven’t seen my parents in almost a year and I haven’t seen my sister in almost two years. I miss them all so much. But most of all, my emotional state is coming from this book. 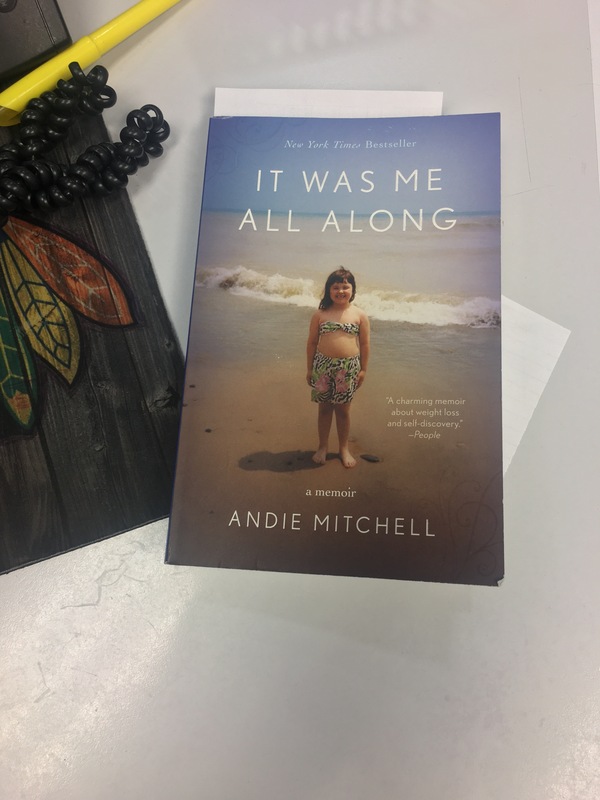 It Was Me All Along is a gut wrenching tale of a woman who used food in times of stress, loneliness, and heartache. As a big girl myself, I am finding a lot in common with this book and author. Today was my weigh-in day. I am sad to say, the number on the scale has not moved at all. But someone in the group that I am in on Facebook posted this quote today that really has lifted me up. So what you’re not where you want to be. At least you’re not where you used to be. Don’t let that discourage you, let it encourage you. All that matters is that you’re taking steps forward, so keep moving forward. Be proud of yourself. I’m not sure who it was that said that, but I needed it today. I’ve been killing it with my workouts this week and I’ve been tracking everything in WW. Even though the scale hasn’t moved, I’m doing what’s best for me. It’s a tough pill to swallow for sure but one that I need to remember. I’m doing everything right and everything in my power to become the person I was meant to be. Keep up the good work! You are doing great! I love you and miss you too!